We’d love your help. 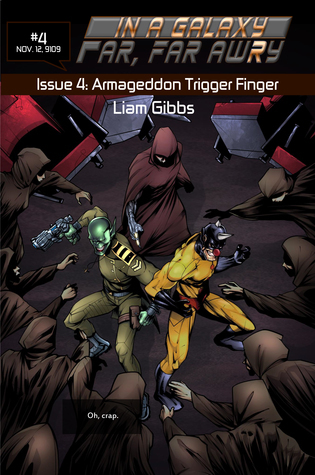 Let us know what’s wrong with this preview of In a Galaxy Far, Far AwRy book 4 by Liam Gibbs. What does it take to get just one single weekend away? Legion is invited to speak at the Intergalactic Peace Symposium, a conference based around military response, as a last-minute presenter to showcase the accomplishments of his team of Good Guys. But work follows Legion along when Master Asinine and his typical enclave of idiots make an appearance in the hopes of capturin What does it take to get just one single weekend away? But work follows Legion along when Master Asinine and his typical enclave of idiots make an appearance in the hopes of capturing and cloning the Good Guy leader. For some stupid reason. Except when Legion and Asinine are joined by a mysterious third faction hell-bent on destroying the universe, the two have to put aside their differences to stop the shadowy cloaked figures. And just who is this Lord Alpha who sent them anyway? To ask other readers questions about In a Galaxy Far, Far AwRy book 4, please sign up.